"As a corporate we have to look as neutral as possible. Matlab dekhne mein neutral lagna chahiyae," said Vineet Jain as "Acharya Atal" promised to "take care of their corporate interests in 2019". Perhaps that is why not many were shocked when Jain and one of his corporate biggies were caught on camera agreeing to promote Hindutva content through the group’s many media properties for a proposed spend of Rs 500 crore, some of which the “client”– an undercover reporter for Cobrapost – said he could only pay with black money. Apart from capturing Jain’s willingness to accept black money from the “client” via a circuitous route that he and his top executive offer to set up, the secretly recorded conversations raise disturbing questions about the extent to which the company is willing to muddy the line between editorial and advertising. 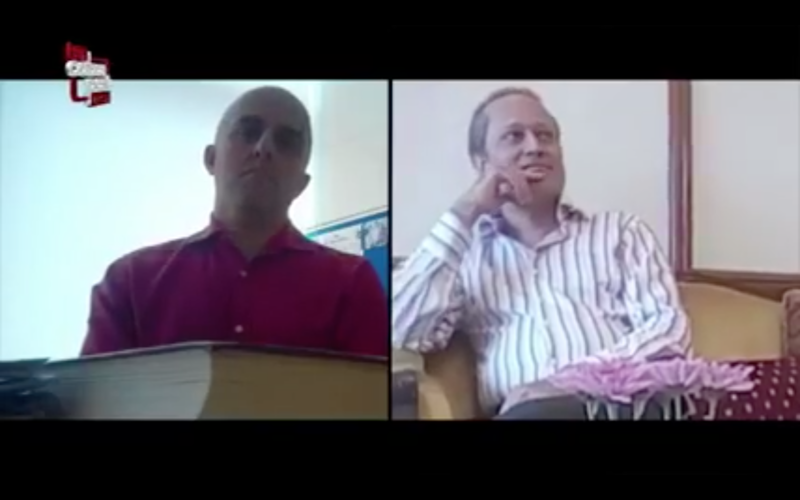 In the Cobrapost exposé, Jain and Sanjeev Shah, executive president of Bennett Coleman and Co. Ltd., can be seen discussing a content deal with undercover reporter Pushp Sharma, who poses as “Acharya Atal”, a man who identified himself as a representative of an unnamed “sangathan”, or organisation, but who gave the impression that he was from the Nagpur-based Rashtriya Swayamsewak Sangh (RSS). In the first meeting between Shah and the “acharya”, the former can be seen bragging about the Times Group’s reach and close relations with those in power. He casually mentions visits by Maharashtra chief minister Devendra Fadnavis and Prime Minister Narendra Modi to Jain and his mother respectively, while nudging “Acharya Atal” to increase his spend in order to grab Jain’s attention. Claiming that the media group made a Rs 2,000 crore profit in March 2018, Shah suggests the sangathan consider spending at least Rs 1,000 crore to make sure they have Jain’s attention. He also promises to help the sangathan‘s propaganda reach over 70-80 million readers in one day. In the second part of the clip, Jain can be seen discussing the content plan. “As a corporate we have to look as neutral as possible. Matlab dekhne mein neutral lagna chahiyae,” says Jain as “Acharya Atal” promises to “take care of their corporate interests in 2019” and advises them to “sell Hindutva as spirituality”. “We will translate that into votes and take dividends,” he assures Jain. He also warns Jain against switching camps in 2019 in case the saffron party isn’t able to win the mandate. General elections will be held in mid-2019. Then the “acharya” can be heard explaining a three-level campaign which involves peddling ‘soft Hindutva’ in the name of Lord Krishna and Bhagwad Gita followed by the use of semi-political material. He claims that they have satirical content prepared that makes fun of “pappu, bua and babua” — nicknames for Congress chief Rahul Gandhi, BSP leader Mayawati and former Uttar Pradesh chief minister Akhilesh Yadav respectively. 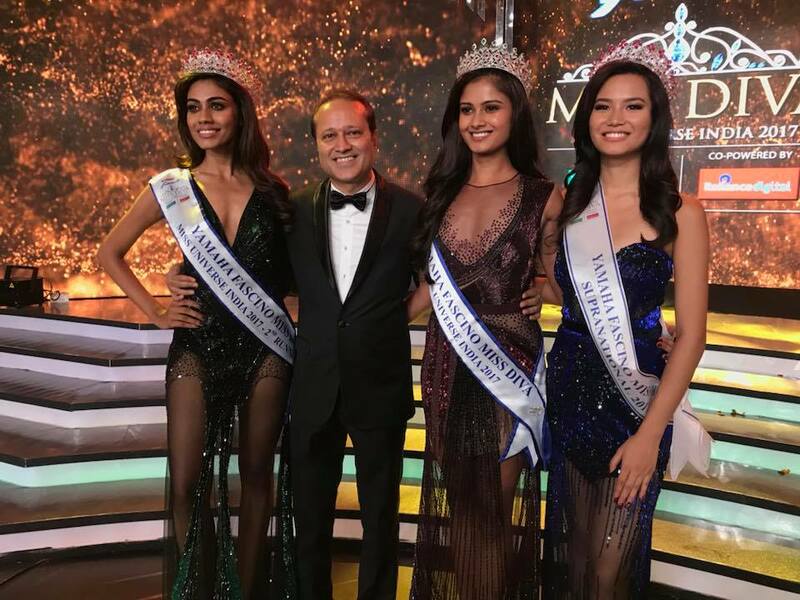 The only time when Jain is seen baulking at his prospective client’s content ideas is when he suggests asking Femina Miss India contestants questions related to Hindutva. Jain is known to take a keen interest in the running of the pageant. The trio then moves on to discussing the payment plan. While “Acharya Atal” insists on paying them in cash, Jain and Shah state their preference for cheques as mode of transaction and say their company has no use for cash. 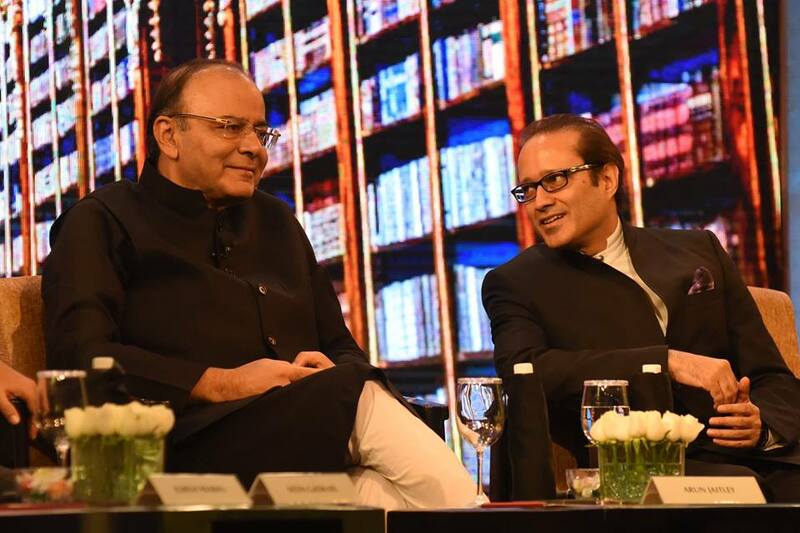 Sharma then suggests a three-part payment system for the first quarter where three payments of Rs 182 crore will be made to the Times Group once the content plan is approved. The trio agree that large payments could get them into trouble if the “next government decides to investigate”. Sharma even offers to route the money through “his company based in Glasgow”, but Jain insists the money be transferred by cheque. Incidentally, the sum discussed – Rs 500 crore – is alone equal to 5% of the total revenue of Rs 9,976 crore that the Times group earned in 2017. In their second meeting, Shah informs “Acharya Atal” that they’ve already formed an internal team that will work across the group’s many properties to take care of the content in the form of videos, TV series, etc. Again Jain and Shah insist on cheque payment instead of cash, while the acharya requests them to at least accept 10% of the total payment (50 crore rupees) in cash. After some persuasion, Shah and Jain agree to take cash as the last instalment at the end of the first quarter. The trio then move on to discuss the names of businessmen through whose companies money can be routed to the Times Group to make sure no one can link the sangathan to this deal. Jain and Shah then suggest ‘Acharya Atal’ use the services of either businessmen Gaurav Dalmia or veteran investment banker Hemendra Kothari or the Adani Group or the Ambani group or the Essar Group as the Jains have friendly relations with all and might be able to convince them to help route the money. Sanjeev Shah also mentions someone called “Kumar” who could perform this service, though it is not clear who he meant. However, it isn’t clear how the transactions would’ve been taken care of in order to dodge the Income Tax department and the finance ministry meanwhile making sure there is no paper trail connecting the “sangathan” to the Times Group. 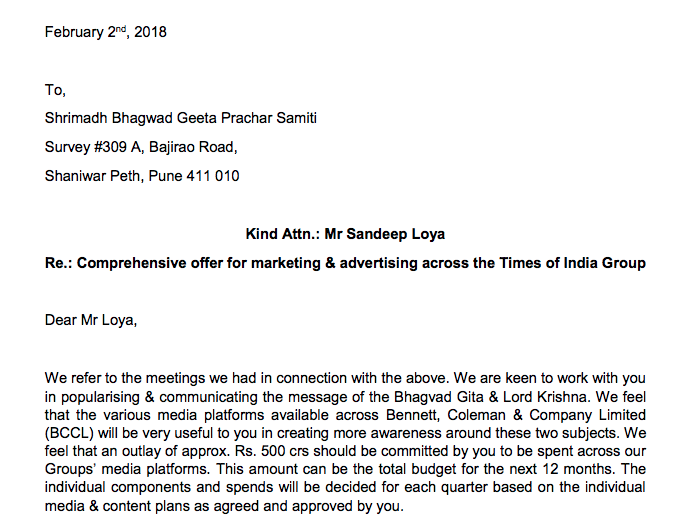 The Wire was able to access the detailed email sent by Shah to the ‘Srimad Bhagwad Gita Prachar Samiti’, the cover organisation “Acharya Atal” said he had created for the deal, which contains the plan detailing how the sangathan‘s propaganda will be marketed and advertised across the Times Group. 2. Magazines like Femina, Filmfare, Hello!, Grazia, Top Gear, Good Homes and Lonely Planet would be deployed to “create awareness and continuing visibility”. The media group also offered to publish focussed magazines curated and customised with research inputs. A similar plan was suggested for Times Books also. 3. The group, which owns 12 TV channels including Times Now, Mirror Now, Zoom TV and Romedy Now, offered to script and produce original TV series. The channels together reach over 120 million viewers, claimed Shah. 4. Radio Mirchi, which has a listener base of over 130 million, would have been used to broadcast special programs on Hindutva. 5. If Shah is to be believed, hoardings promoting the content would’ve been put across major cities including Delhi, Mumbai, Kolkata, Bangalore, Hyderabad, etc. 6. The group also promised to leverage ET Edge, a brand under which it hosts business summits, to invite speakers aligned to their client’s ideology at global and local conferences. 7. Events like Filmfare Awards, The Economic Times Awards for Corporate Excellence, Mirchi Music Awards, Femina Miss India and TOIFA Awards would have also been used to broadcast the content. These events grab a lot of eyeballs because of the huge number of celebrities and politicians who attend them. 8. Times Group’s Junglee Pictures, which has produced movies like Dil Dhadakne Do, Talvar and Bareilly Ki Barfi, could produce long format feature & short films focussed on the sangathan’s ideology. Similarly, Times Music was supposed to loop in “distinguished musicians & artistes” and host global and local concerts. 9. 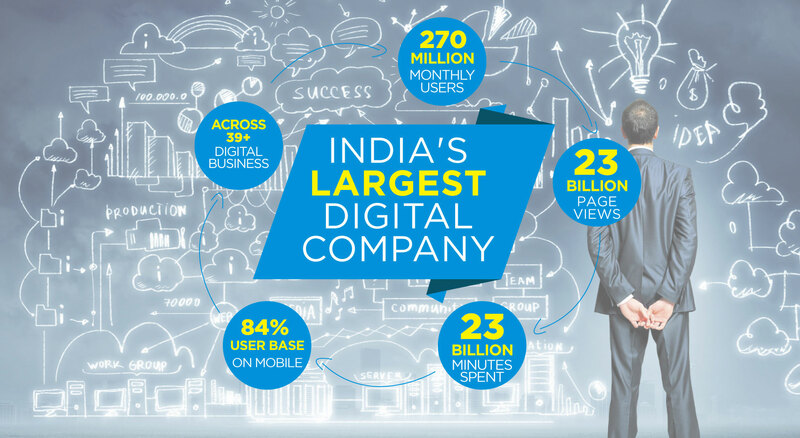 Times Group’s digital leg, which receives over 232 million unique visitors a month who collectively account for 10.4 billion page views and 10 billion minutes spent across web and mobile, would have created “fictional & documentary type content”. “This is the biggest platform in the group and can be used for massive distribution and access”, claimed Shah. Meanwhile Times Studio, a recent addition to the media group, would’ve been leveraged to “develop and produce high quality digital content for OTT platforms and brands”. 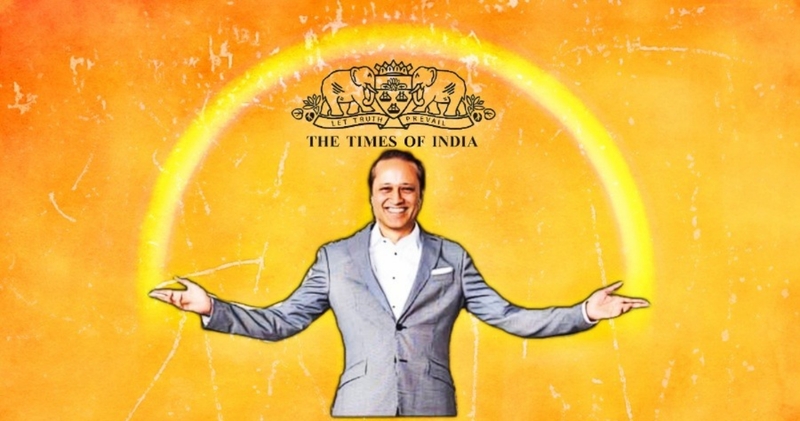 While Samir Jain, called ‘VC’ by his staff, often gets most of the credit for Times Group’s success, Medianet – a cash cow for BCCL – is known to be Vineet Jain’s brainchild. Under this scheme, advertisers officially buy advertising space but staffers say this also gives them a certain amount of space for promotional pieces in the news pages. The scheme was best described by Caravan magazine when it profiled the senior Jain. “By many accounts, Medianet is the most miasmic development in Indian journalism in decades. In the varicose veins of the industry, anecdotes clump up, like bad blood, about how Medianet has even infiltrated the main paper, such that the generosity of an advertiser can be rewarded with positive coverage—implicit bargains that are impossible to prove or to track,” wrote Samanath Subramanian. “Medianet played upon two of Samir Jain’s most constant apprehensions about his newspapers: that they were, in just the regular process of reporting upon people or companies, providing them free and quantifiable publicity; and that his journalists were making a side income by writing pieces in exchange for money or other benefits,” he added. One of the sinister examples of coverage under Medianet came to notice soon after demonetisation was announced. “It’s a gospel truth that Narendra Modi is the best prime minister of the country. The initiatives undertaken by the honourable prime minister have brought a paradigm shift in the country’s progress…” – claimed an article in Times Group’s Mumbai Mirror. While the article appeared on the Mirror website with no disclaimer, in the print edition it was published on page 27, which was marked in small print on the top of the page as ‘Promotion of business of entertainment’ – also known as advertising. The Times Group hasn’t always had a cordial relationship with the ruling party. If rumour mills are to be believed, Modi, who was supposed to be the chief guest at the Economic Times’s Global Business Summit in March 2017 pulled out of the event at the last minute leaving the media group red-faced. NewsLaundry quoted various sources who cited multiple reasons for the the prime minister’s decision to stay away: from the paper’s coverage of the UP polls to Vineet Jain’s critical “demonetization tweets” to TOI’s cartoons taking potshots at the government to Modi spoofs on Radio Mirchi and so on. 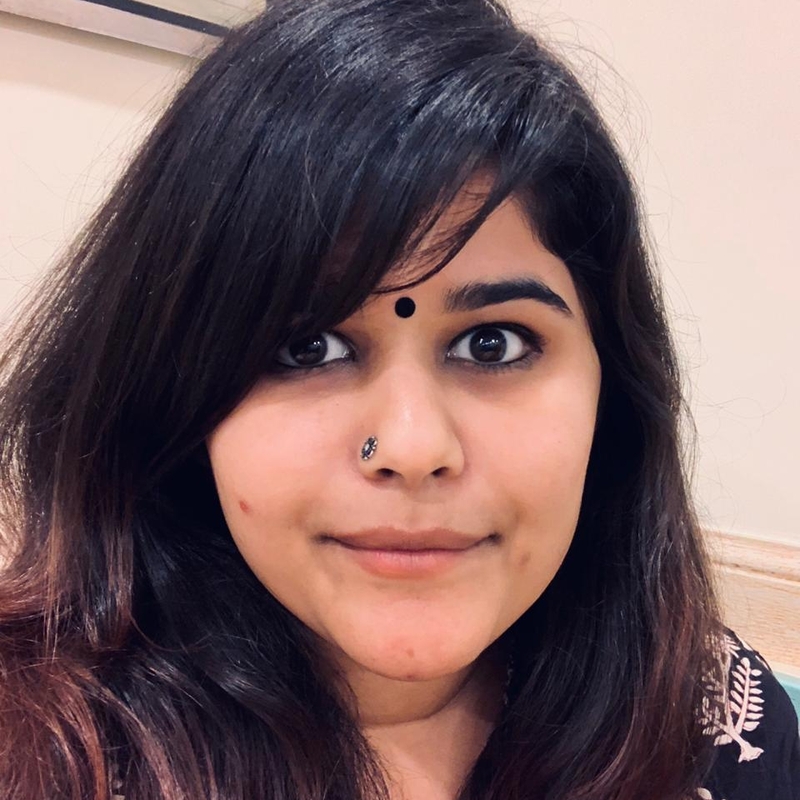 The controversy flared when former ET journalist Rohini Singh, who covered the UP elections extensively, deleted her Twitter account and Radio Mirchi discontinued its show ‘Mitron’. Modi’s move left many surprised as the Times Group’s news channel, Times Now, had been running campaigns in favour of demonetisation – which Modi had said was needed in order to deal with black money. Later, a leaked WhatsApp message in June 2017 revealed the extent of collusion between TOI editors and the Narendra Modi government. Sent mistakenly on an internal TOI journalist group by the paper’s executive editor, the message detailed how he, along with former Economic Times and OPEN magazine editor, lobbied on behalf of an unnamed income tax official with finance minister Arun Jaitley. In July 2017, a story published by the TOI’s Ahmedabad edition about an apparent increase of “300%” in BJP president Amit Shah’s assets over the past five years was removed from the newspaper’s website within hours of being published. No explanation was ever given by the newspaper for pulling the plug on the news item from its website. The Wire had also reported that TOI decided to delete its tweets and Facebook posts alerting readers to another story involving Smriti Irani: ‘PIL accuses Smriti Irani of fraud in MPLAD funds’. Irani is believed to have objected to the story, which appeared on July 27, 2017. In September 2017, another story carried by the Times of India‘s Jaipur edition criticising the Narendra Modi government’s Pradhan Mantri Fasal Bima Yojana, was taken down from the newspaper’s website within hours of publishing. You can read The Wire’s complete coverage of the Cobrapost investigation here. At the outset, we reject all of your motivated and coloured questions, which presume that the content presented by cobrapost.com is genuine. We squarely deny all of the allegations made by cobrapost.com. They have maliciously presented a one sided view of the events, with intention of creating sensationalism at the expense of our organisation and to adversely affect our reputation, standing and integrity before the public. We had provided our detailed response to cobrapost.com, which debunked all of their malicious assertions against us, but our version has not been included by them in their report. They have chosen not to publish such material, hence non-inclusion of our specifically relevant factual inputs was an act of wrongdoing with knowledge and ill intent to create a fictitious scandal, against which we shall proceed suitably. This was also an act in breach of journalistic ethics, for which they should be ostracized. The content presented by cobrapost.com is heavily doctored, incomplete and has been presented in a selective manner using out of context statements by us. The story presented by them is completely false and fabricated and we have already forwarded the matter to our attorneys for necessary legal action. Cobrapost.com has been dishonest and malicious in their reporting, especially when they have all relevant details from us, which they conveniently chose not to consider. For example, we had informed them that we were aware that the reporter in question was a dubious character and our senior functionaries played along with his activities to reel-him in to discover his true intent and backing and to find out which business house or political parties were behind him. In fact, it was our reverse sting, carried out knowingly with a plan to make him commit a mistake and expose the people behind him. We have substantial evidence with us regarding this and our act was carried out with the advise of our legal team and investigation team. As there was only an activity to trap cobrapost.com representative and to bring him out as an imposter, no actual business dealing was done and no money was exchanged in any form whatsoever. In fact, the reporter was insisting on payment by cash and we continued reeling him in to understand his backing. If he had signed a contract on this subject, we would have been able to expose his criminal activity. Even when this ruse was on, we only made a marketing offer to reel him in to reveal his antecedents. We categorically state that we do not deal in cash in any manner and all of our large business dealings happen in a legal manner though necessary banking channels. Our statements made in this context were misquote and misrepresented by cobrapost.com, with knowledge of wrongdoing. In light of the above noting, we advise you to refrain from publishing any derogatory or defamatory content against us relying on the illegal and malicious assertions made by unethical and malicious entities like cobrapost.com and their reporters who have a criminal past and who are out on bail and who have spent considerable time in jail for illegal activities including fraud and forgery. We hope that you shall consider our views favourably, remove any defamatory content against us from your website / social media accounts and desist from making any further defamatory statements against us. You would agree that uploading any cobrapost.com content without verifying the facts from us is unethical, contrary to journalistic duties and not befitting a media house like yours. If you are ill advised to present the cobrapost.com narrative in the same manner as they have, or in any other manner to defame us, we shall be restrained to initiate suitable legal action against your organisation as well to protect our reputation. For Bennett, Coleman & Co. Ltd.